It will never again take more than a year to move from one major version of Firefox to the next, at least not unless Mozilla decides to change the current development specifics again. You may have already heard that you can expect new Firefox releases every three months from now on. The development specifics that detail the process have been updated yesterday, and make up for an interesting read. Mozilla groups the repositories into development and release processes. Mozilla-central is part of the development process, the remaining three repositories are all part of the release process. How many users and releases can you expect in each repository? Nightly (mozilla-central): Nightly releases, currently 50,000 users, Mozilla estimates a rise to 100,000 users. Aurora: Nightly releases, currently 0 users, Mozilla estimates 1 million users. Beta: Weekly releases, currently 2.78 million users, expected rise to 10 million. Stability improves from the first nightly releases to the final release versions of the web browser. Versioning has been modified as well. Take a look at the following chart. 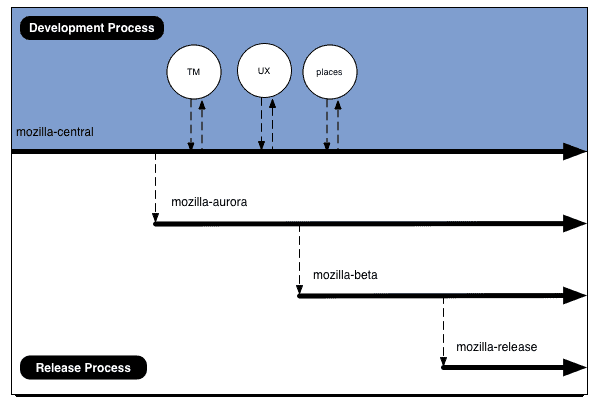 Mozilla-central and aurora builds can be distinguished by a1 and a2 at the end of the version. Plans are to get rid of the "pre" versioning. Gecko, the rendering engine will follow the Firefox version scheme, for Firefox 5 Gecko would be 5.0 and so on. The general schedule of milestones hands over the development process to the next repository every six weeks. 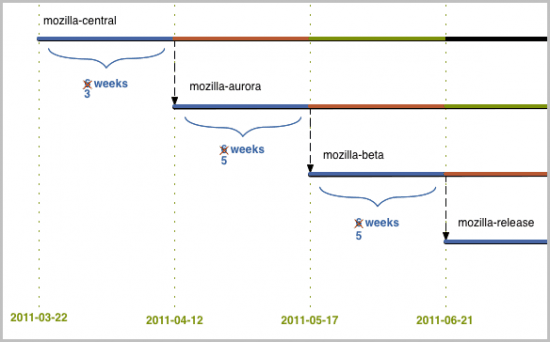 After six weeks the mozilla-central build will move to mozilla-aurora, where it will be managed the next six weeks before it is moved to beta, and after another six weeks to the release repository. Once a build has been passed on work begins on the next build in line. The scheme is different for Firefox 5, which sees an accelerated development. Instead of 18 weeks in total, the Firefox 5 development process will only take 13, with a final release on June 21. Firefox 6 development starts in 5 days on April 12 when the Firefox 5 build is moved from mozilla-central to mozilla-aurora. Mozilla expects to release Firefox 6 on August, 16th. There you have it, two new Firefox releases in the next four months, who would have thought that a year ago? There may be changes to that schedule, for instance if development is delayed at some point. The general release schedule stands on the other hand. Probably the most interesting new aspects are the new aurora channel which is releases as nightlies as well, but supposed to be more stable than the mozilla-central nightlies, and that beta releases will be more frequent due to a weekly release schedule. It is likely that part of the Firefox user base will move to the beta and aurora channels to stay on top of the browser development without having to face the stability issues that the initial nightly builds might be causing. I am skeptical about the release dates. Given the length of the delays in Firefox 4, it seems likely that the development time will be extended for the next two versions. Considering the amount of improvements they are aiming for (https://wiki.mozilla.org/Firefox/Roadmap), even getting half of the things mentioned by August may be a bit difficult. Anyway, the idea of using different repositories makes sense, and it will bring updates to users in a more efficient manner. Also, the schedule ensures that the project will not appear to be “stuck in alpha”, as other projects with long development times sometimes do.